Economy Signs first opened their creative doors in the summer of 1973. The original craftsmen were Peter Dalsgaard, a creative genius and Tom Harwood a seasoned signpainter. In the years to follow, Economy Signs built a reputation for treating every customer as if they were family. They produced distinctive signs using well thought out design, an exceptional taste in colors and incorporated many fonts hand drawn by Peter that are still used today. In 1979 Peter became ill and the business had to be sold. Peter and Tom wanted the business to be taken over by someone who would continue the Economy Signs vision for excellence in both creative design and customer service. Louis Pascuzzi, a recent graduate of the sign arts program at Butera School of Art in Boston was their choice. Louis aready had a great deal of experience in providing custom artwork and lettering for area auto racers and adding signs to his portfolio was the next step. He spent a year learning the ropes of making signs and running a successful business. In 1980 he was joind by John Vendetti as a partner. John brought in his extensive knowledge of metal fabrication, welding and painting. 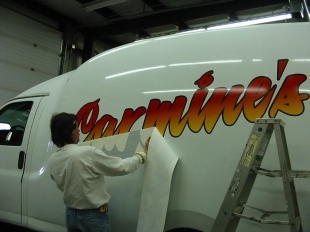 They are best known for their creative and affordable truck lettering and vehicle graphics. They have aslo designed and produced every type of sign imaginable. 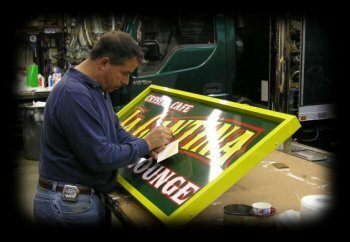 From hand carved gold leaf signs to large illuminated electrical displays. Economy Signs is still going strong 37 years after the doors first opened. They continue to provide great customer service and their award winning sign designs still stand out above the crowd.